Within five minutes, NBC 30 weatherhero Ryan Hanrahan retweeted it. Hartford Courant columnist-slash-hiker hero Peter Marteka retweeted it Connecticut tree guru Frank Kaputa followed suit. My heart went aflutter when Kurumi – THE Kurumi – notice my tweet and asked me about it. Someone recognized it as being in North Stonington – again, this was just from a closely cropped satellite image. Many questions were asked about this mystery bridge. I didn’t have many answers. But as luck would have it, the reason I was poking around that part of our state was because we were all about to head down there for the day. I promised the questioners I would check it out. Or not. Unfortunately, 2007 happened. And then 2008 and 2009 followed suit. The land had been cleared, the roadway mapped out, even some utilities had been put in place. Oh, and a handsome covered bridge had been built. But no houses. Not a one. 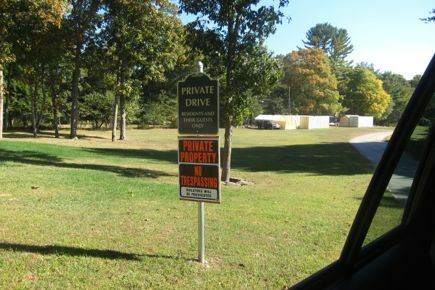 I turned down the packed dirt/gravel/grass road and passed a rather clear set of “No Trespassing” signs. I didn’t really care because a) I knew no one lived down this road to nowhere, b) it was a dead-end, and c) If I was taking my family on a hike at the Donald R. Henne Memorial/Shunock River Avalonia property, I’d be parking on this empty road anyway. I don’t usually trespass, but when I do – always for you guys! – I try to justify it. 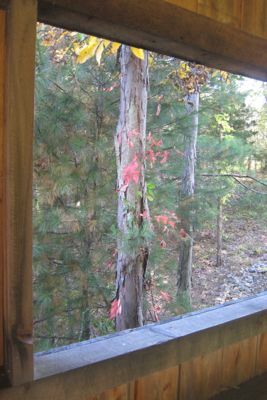 “… trail work has started on the newly acquired Donald R.
Henne Memorial Shunock River Preserve, according to the Avalonia Land Conservancy. The 74-acre property was donated by attorneys Steven Reck, Raymond Trebisacci and Joseph Mascaro as part of their Shunock River Estates development and is named in honor of Don Henne, a biologist active on the North Stonington Conservation Commission. Henne was an early advocate of preserving this stretch of the Shunock River. Henne also was the project leader of the U.S. Fish and Wildlife Service Southern New England – New York Bight Coastal Program, and was a member of the Long Island Sound Study Management Committee. He died in 2007. 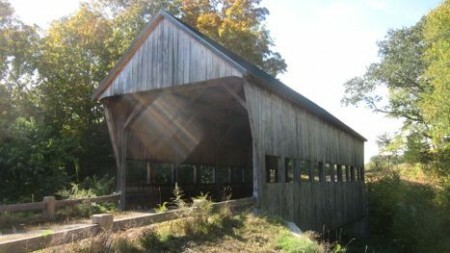 Once that was settled, the lawyers three got the town to permit their radical covered bridge in January 2008. Here’s proof of that! Almost a year later, with the economy still in the crapper, the developers pushed forward and contracted with a builder! The bridge would be built! Before a single house is ever sold! (Or built, for that matter!) Here’s your December 2008 article on this momentous occasion. And so, the bridge was built. Oddly, this fine covered specimen straddles a very tiny creek. Anyway, here it is being built in 2009. And hoo boy, those houses at the Shunock River Estates were gonna be beauts. I’m sure this page will cease to exist in the near future, but for now, drool over those amenities. Puhleezz. “Cedar-impression shake-style siding? 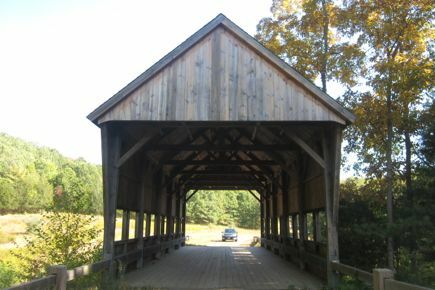 !” Who cares about any of that stuff when you get to drive through a covered bridge at least a couple times per day?! The bridge is very nice. It is solid and smells like wood (wood that was harvested from the trees they took down to not build the houses, by the way.) I got out of the car and ran into the bridge. My kids were not as excited about the bridge as I was. My wife took pictures of me on her iPhone prancing on the bridge. I stood in the middle of it and contemplated its fate. Here I was, standing on a quite new, quite nice, quite solid covered bridge on a gravel/grassy road to, literally, nowhere. It had been 5 years since it was built, and 7 since the Shunock River Estates were planned. The nearby casinos are floundering. Money isn’t dumping into New London County – or even the fictional “Mystic County” of the state’s tourism geniuses. I do not think any houses will ever be built here… but could be wrong. Someone has been paying to keep the roadway mowed at least. I did hear that the land trust was given more land here, on the other side of the road to nowhere. 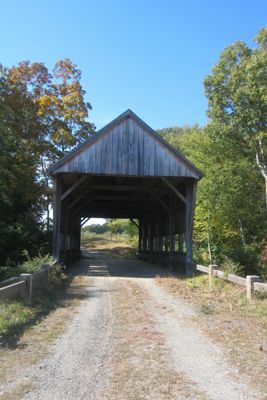 So there we have it – we avid Nutmegger hikers now have a beautiful covered bridge in southeastern Connecticut all to ourselves. Maybe – and I’m not joking here – maybe it will be deeded (or whatever) to Avalonia for some usage I can’t quite dream up right now. Someone remind me to check back on this in 2020 or so.